The bottom-aligned menu that sticks to the top when you scroll. This is the best title I could come up with. 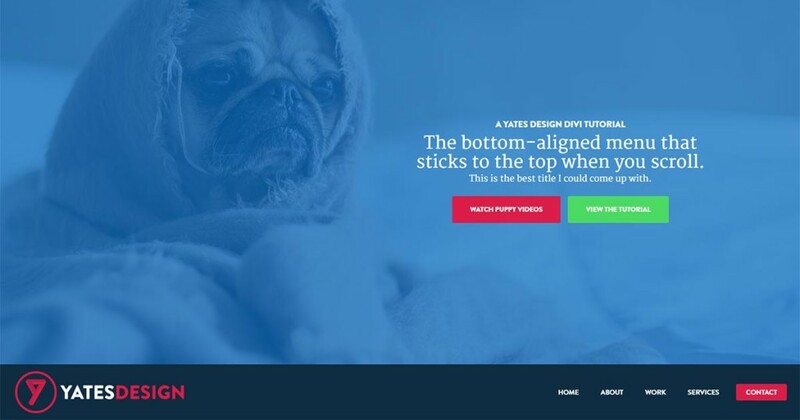 Divi Tutorial – the bottom-aligned menu that sticks to the top when you scroll. Update! The plugin Sticky Menu (or Anything!) made some changes in version 2.0 which broke the effect in this tutorial. I’ve updated the tutorial below to reflect those changes. If it’s broken your site you need to enable Legacy mode in the plugin’s settings and change the CSS code from #main-header.original to #main-header.sticky-element-original. After that everything should work the same. This is a page layout I’ve wanted to try and figure out ever since I came across the BrewLife website on Divi Theme Examples. The BrewLife site works on all screen sizes but I’m only going to enable this version on screen sizes greater than 981px. The reason for this is that the default Divi mobile menu expands downward on click which won’t work with this layout. The way the BrewLife site has solved this is by swapping the Divi mobile menu for an off-canvas mobile menu. The tutorial will also only be enabled for the homepage of your site. If you want to enable it on different pages just adjust the “body.home” references. Disable fixed navigation bar in the Divi Theme Options. Set “Do not stick element when screen smaller than: (optional) ?” to: 981 pixels. In the Advanced Settings tab, enable Legacy Mode. Add a title, subtitle, buttons, backgrounds & text as you see fit for the module. Add the following to your page’s Custom CSS. In Divi 2.7 you can add Custom CSS to individual pages by clicking the hamburger icon at the top of The Divi Builder. Add some more content to your page. In the first section after the fullwidth header you’ll need to add some extra padding to make up for some of the above adjustments. I’ve set the top padding of this section to be 10%.